Free Network Analyzer is a software network packet sniffer and protocol analyzer for Windows platform. Using this free network monitoring software you may intercept any data transmitted via wired broadcast or wireless LAN (WLAN) and Internet connections of your computer. Our freeware network sniffer allows you to capture, filter and display any traffic data flowing through your network adapters. It decodes captured network communication packet's raw data, displaying the binary, hex, decimal and text field values in the each packet, and analyzes its contents according to the RFC and other specifications. Packets data is parsed, extracted and represented in simple human-readable form, allowing you to perform effective forensic analysis of any data transferred via your PC network interfaces. Our free network monitoring tool supports real-time protocol analysis and effective dataflow processing even under high traffic load on high data rate communications. Our free network sniffing tool supports filtering and displaying data filtered by specific protocol. Our free netflow analyzer provides you with ability to search for data patterns with RegEx (Regular Expressions) support. Our free network packet sniffer allows you to customize configuration of the workspace and tune the way which raw data stream is displayed on the screen. Our freeware network traffic monitor supports importing log files from third party protocol analyzers. Our free network traffic analysis software allows you so specify binary, hex, decimal and text patterns to be highlighted in the dataflow. Our free network sniffer for Windows supports more than 70 different data encodings. Free network analyser enables you explore and trace any packets from all local area network adapters and most popular Wi-Fi wireless network adapters which supports IEEE 802.11 network protocol standards. Explore, view and monitor all Ethernet and Internet IP, TCP, UDP and ICMP packets with ease. Our software network protocol analyzer installs NDIS filter driver over the network adapter device driver and then monitors all requests passed via Windows network interface. Program parses, decodes and analyses entire content of all packets passing through your network adapters. Any traffic which flows via opened network ports may be also captured and analyzed, allowing you to view and trace all data transferred by network applications or devices. This free network data explorer supports advanced data filtering, highlighting and searching for patterns with regular expressions, which makes this software extremely useful for deep network traffic analysis. Our free network protocol analyzer software is designed for effective intercepting, capturing, decoding and monitoring of network communications. This free network traffic monitoring software processes monitored data in real-time even for high data rates; it remains responsive during 1 Gbit/s network communications monitoring even on budget desktop PC. Superior performance of this network protocol analyser makes it extremely useful for real-time network monitoring applications. Capturing and interactively displaying of data transferred via network connections now made easy! Our free software network monitor supports Windows desktop and server platforms starting from Windows XP (32-bit and 64-bit) and including Windows 8/8.1 x86 and x64 operating systems. System requirements: Our free network protocol decoder/parser/debugger requires 2 GB of RAM and 256 MB of free hard disk space. In addition, our netsniffer (networksniffer)/netanalyzer shows data transmitted by any other protocol in form of easy configurable raw data stream. Perform network forensics and analysis with our Ethernet packet sniffer and analyzer. 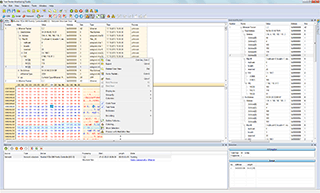 If you are looking for software based solution for development and debugging network applications, devices and drivers, Free Network Analyzer is what you need. It requires no hardware and allows you to test network communications and debug protocol errors, view and fix device failures. This also probably the best network packet capture software for novices. Download this free tcp packet sniffer, start to monitor and analyze LAN and Internet traffic in just few seconds! Fast. It works on high transfer rates without affecting PC performance. Real-time. It allows you to analyze data without delays on high transfer rates. Flexible. It supports advanced data filtering and layout customization. Social. It allows you to ask questions and get answers from experts. FREE. It costs you NOTHING! Max session length: 15 minutes.